The Cistercian Alumni Association honored alumnus and local Luis Barbero, class of 1991, with the 2019 Jim and Lynn Moroney Award at the Park City Club. Barbero received a B.A. in accounting from Southwestern University before launching his career at Universal Display & Fixtures in 1994. 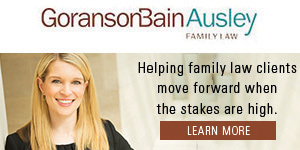 He is now a vice president at the company and living in Preston Hollow. Throughout his post-Cistercian life, Barbero has steadily maintained his ties to the Cistercian community. He served a two-year term as president of the Cistercian Alumni Association and continues to attend and help out at alumni events. Barbero’s community work extends far beyond Cistercian. He is actively involved at St. Monica’s Catholic Church where he is an Extraordinary Minister of Holy Communion and a trainer for the Stephen Ministry. He has volunteered for the Bishop’s Pro-Life Dinner, CPLC’s Project Gabriel, and Camp Moss, a summer camp for children afflicted with heart disease. He is an officer in the Knights of Columbus where he attained the rank of fourth degree.